Marines with Combat Logistics Regiment 35 and Headquarters Regiment, 3rd Marine Logistics Group, participated in a reconnaissance, surveillance and decontamination (RSD) course conducted by chemical, biological, radiological and nuclear (CBRN) Marines July 17-19, 2018 at Camp Kinser, Okinawa, Japan. The RSD course teaches Marines to effectively react to a CBRN incident and save lives of Marines exposed to deadly agents, said Lance Cpl. Matthew Lewis, a CBRN defense specialist with Headquarters Company, CLR-35, 3rd MLG. “Marines are expected to learn the basic fundamentals of chemical, biological and radiological warfare as well as the actions to take in a CBRN incident such as decontamination and immediate action drills,” said Lewis. The course also covered chemical dissemination and the effects of CBRN attacks and different types of equipment such as chemical detection papers and alarms used to detect various chemical agents. 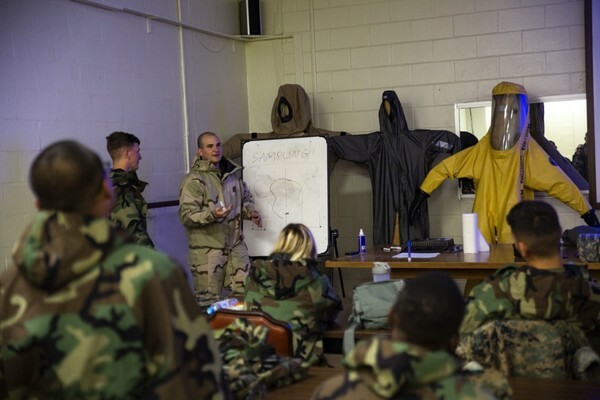 During the course, Marines practiced donning the M50 Joint Service Protective Mask and the Joint Service Lightweight Integrated Suit, also known as the mission oriented protective posture suit (MOPP). The MOPP suit included a blouse, trousers, gloves and boots to protect Marines from CBRN agents. For many Marines, the only CBRN experience they have is their annual requirement, the gas chamber. However, the RSD course provides Marines with expanded knowledge on detecting and combating CBRN incidents. “They get a little idea of what we do, they see the equipment and what the equipment does and they get experience with it,” said Cpl. Tyler J. Beard, a CBRN defense specialist with CLR-35. After the RSD course, Marines are expected to demonstrate what they learned by detecting, reacting and decontaminating a CBRN environment.